Harbour Island is just 3 miles long and one mile wide. The Bahamian out island is known for its pink sand beaches and being home to more billionaires per capita (3) than anyplace in the world. You’re as apt to bump into a super model as witness a chicken scoot across the street. If you walk down to the east end of the island, you’ll find shrubbery hiding what must be a small farm. 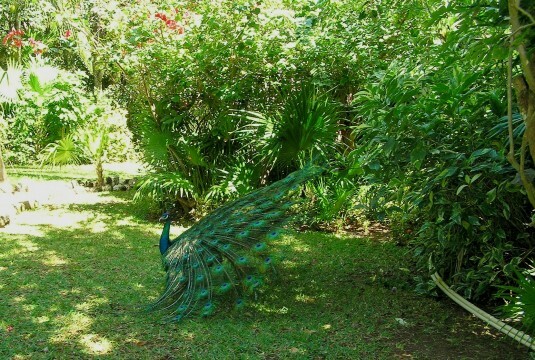 In the morning hours, on the other side of the shrubs, you can hear roosters tuning up for the day. 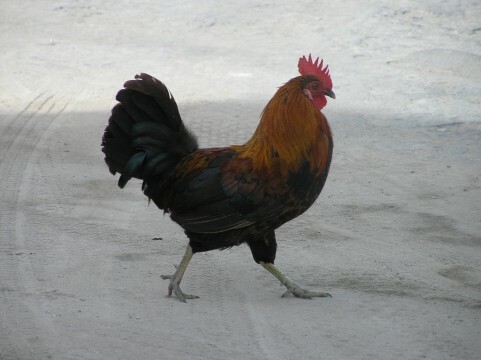 You definitely won’t find these roosters auditioning on The Voice. I dubbed this choir group “Roosters in Training.” It was quite comical listening to roosters that hadn’t quite reached puberty. Anguilla’s 33 beaches compare to any in the world. Their restaurant choices are a foodie heaven. 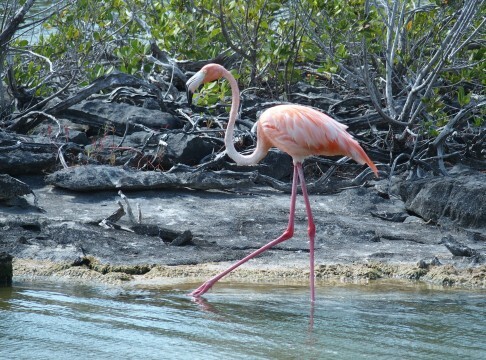 This island is also where birds and cows coexist like you wish neighboring countries would. While tooling around Anguilla in our rental car, we couldn’t help falling in love with the homes featuring color palettes you’ll rarely find anywhere but in the Caribbean. One of the best examples was a purple home that the musical artist Prince could make Purple Rain album worthy. What made this house especially memorable were the two inhabitants in the front yard. 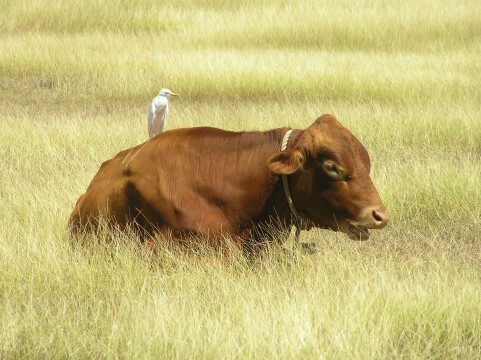 A bird was perched on the back of a cow in a way that made you question, “When did this romance start?” Some questions are better left unanswered. Why argue with bliss? The island of St. John is as picturesque as any you’ll find in the Caribbean. This left, right, and straight ahead beauty becomes a hazard when you’re driving the island’s winding roads. One thing sure to make you slow down is when you notice a grouping of donkeys hanging out on the side of the road. As you roll down the window and begin to shoot photos, that’s when the fun begins. The donkeys of St. John know you’re slowing down for one of two reasons. The vacationer either wants to shoot photos or feed donkeys. The donkeys are hoping it’s the latter. Chances are better than 50-50 that the donkeys will amble over and go so far as to stick their head in your car window. 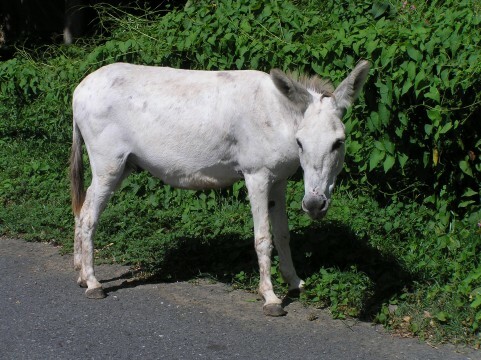 St. John donkeys are big proponents of meals on wheels. If you’re a lover of turquoise water, then absorbing the beauty of Maroma Beach is a sight to behold. For over 30 years, the Belmond Resort & Spa captures the Riviera Maya life in a way that is simply breathtaking. Around the same moment you think the Belmond’s scarlet macaw is suitable for framing, you notice another masterpiece of feathered artwork strutting its stuff. A peacock is to Maroma what orioles are to Baltimore. Fitting indeed. Charlotte Amalie Harbour on the island of St. Thomas sees almost two million cruise ship passengers each year. Many are seeking the perfect photo opportunity to help make a vacation memory. 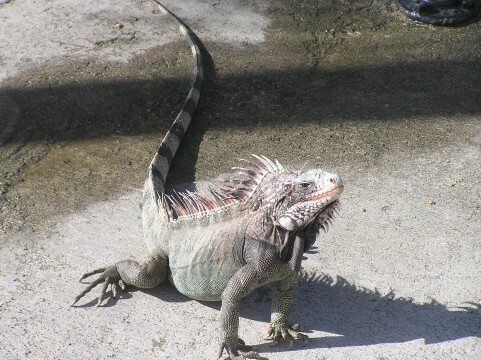 It’s hard to miss the iguanas sunning themselves along every nook and cranny of St. Thomas. What’s interesting is many of them pose like a Kardashian on spring break. I’m not sure if this is unique to St. Thomas or if iguanas are born with a “show off” gene. Regardless, these thick-skinned reptiles definitely should be on the ambassador payroll of the St. Thomas tourism board. After taking the ferry from Great Exuma, you’ll find just one business on petite Stocking Island. The Chat N’ Chill beach bar is exactly what you hoped for when conjuring images of the words “beach bar’ in your head. Upon absorbing the surroundings and fellow vacationers at play, you’ll hoist a beer, grab a bite, and see what makes this Caribbean playground so special. Turquoise water is everywhere you look, so the tepid ocean is hard to resist. If you feel a gentle nuzzling going on around your ankles, it’s not the powder white sand getting fresh. 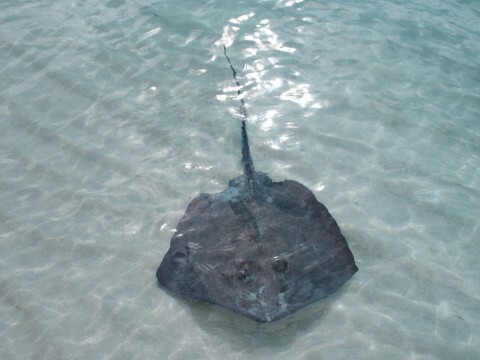 On Stocking Island, the stingrays are so used to vacationers rewarding them with conch meat, they sometimes take the lead in getting to know you. Once you get past the initial shock of frolicking with something whose first syllable starts with the word “sting,” it’s just another happy reason to enjoy this Caribbean wonderland. Provo Golf Club is the only golf course on the Turks and Caicos Island of Providenciales. The golf course opened for business in 1992, about the same time that vacationers from around the globe discovered the course’s beloved neighbor. The neighbor is Grace Bay Beach, a 12-mile beach that Trip Advisor regularly ranks as the best beach in the world. With amazing Grace located just a stone’s throw from the golf course, playing 18 holes in paradise becomes a guilty pleasure. Especially when you realize there are live versions of the world’s favorite lawn ornament on the course. Pink flamingos regularly do their one-legged thing on Provo Golf Club’s front nine. They seem to add another slice of serenity to this meticulously manicured golf utopia. On the island of Nevis, vervet monkeys match the population of humans. These green-hued critters are both extremely evident and often times invisible. One of the main stomping grounds for Nevis’ vervet monkey tribe is the Four Seasons Nevis Golf Course. 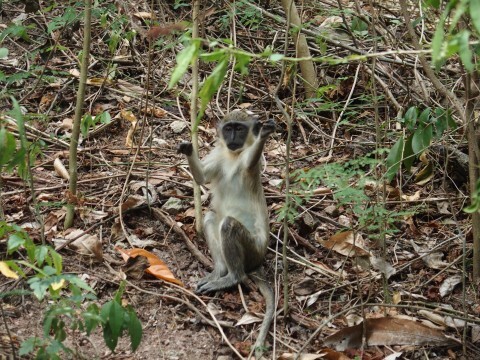 When the Travel Dreams team played golf, they saw nary a vervet monkey. How could this be? We discovered sunset is the vervet monkey equivalent of happy hour. The Four Seasons golf pro confided that the back nine before sunset is when vervets come out to play. Sure enough, after motoring our golf cart down the path into the jungle setting between the 10th and 11 holes, that’s when we found vervets on parade. About a dozen vervets were in various stages of play, sway, and mango eating. Monkey mission accomplished. Yes, the Caribbean Sea in Great Exuma has shades of turquoise that is off the charts beautiful. 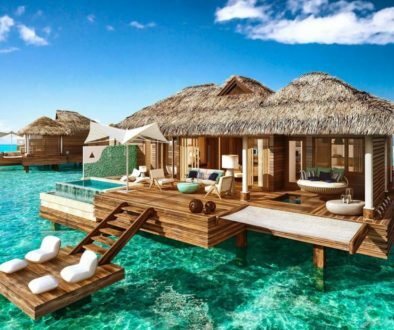 Yes, the gorgeous water is one of the main reasons you’d wish to visit this Bahamian out island. 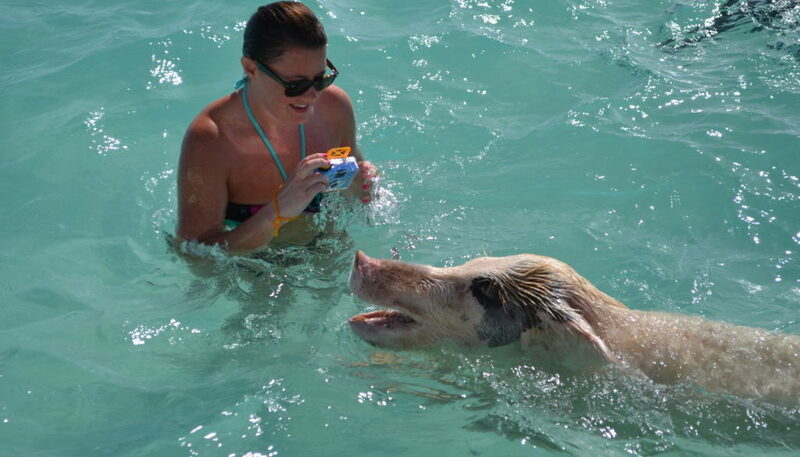 Then again, when in Great Exuma, do as the piggies do. That means heading by boat to where pigs love to swim, dive, and socialize with boaters offering appetizers. To watch pigs swim is a might surreal. It’s like witnessing cows dancing or ducks playing blackjack. 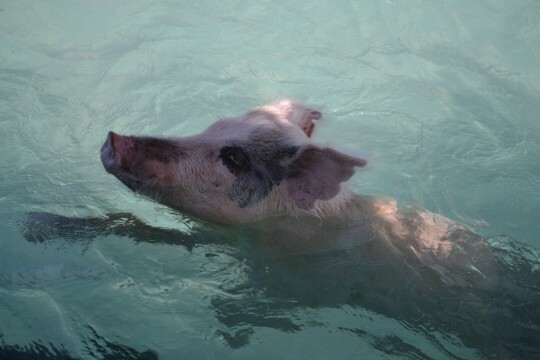 Once you’re in the middle of the ocean with pigs doing the sidestroke, you can’t help but smile. Our favorite Caribbean wildlife moment was, for us, the most touching. It all started when we were on the 4th hole of the Four Seasons Nevis Golf Course. About the same time I was about to hit my second shot on this Par 4 facing the Mt. 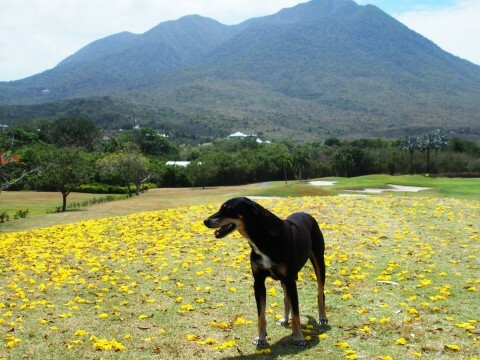 Nevis volcano, a dog named Coco came galloping up to my golf ball. The day before, we had heard there was a dog that loved hanging around the golf course. We also learned that Coco was a stray with no owner or home. Coco stuck with us for the last 14 holes. He’d wait until I hit my shot, then he’d race to where the ball settled and patiently wait for me to arrive. After golf, we’d soon discover that Coco would make his way back into our lives. For the balance of our vacation, whenever we’d stroll Pinney Beach, Coco would show up out of nowhere and accompany our walk. Coco must have had a hard life because he wouldn’t allow you to pet him. But he seemed to take joy in keeping us company. We’ll never forget Coco, the golf- loving and beach-walking dog.